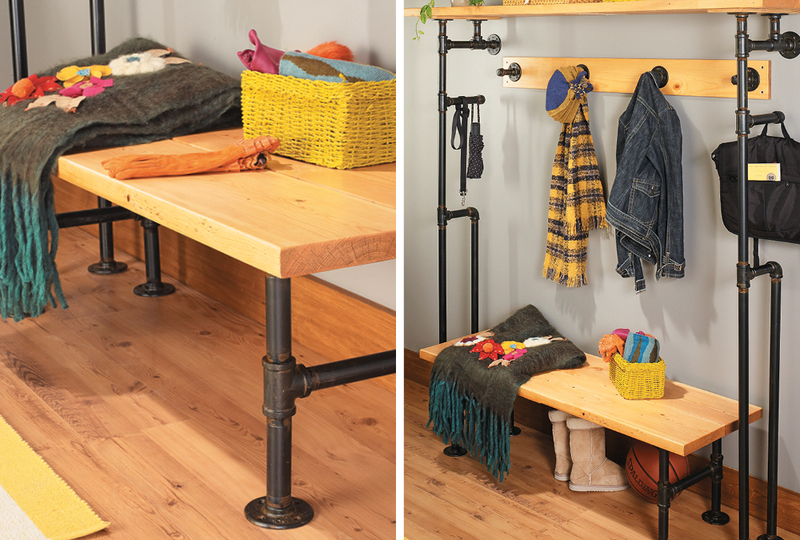 The pipe-frame shelf unit from last week’s eNote adds a lot of storage to your space, and this bench and coat rack will help you pack even more function into the room. Both projects can be assembled with readily available pipes and fittings. The pieces have a surprisingly versatile style that would look great in almost any space and could also be used as stand-alone pieces in other areas of your home. Let’s take a look at each project and how it's constructed. We designed the bench to provide a place to sit while you’re putting on your shoes or flipping through the mail. Like the shelf unit, it rests on flanges that you can twist to level the project on uneven floors. Start by cutting two boards and three cleats for the bench’s top. Then screw the cleats to the undersides of the boards (photo 1), and stain or seal the shelf. Next, connect the pipes and fittings to form the bench legs. Then join the legs for each end of the bench with a horizontal length of pipe (photo 2). Finish the bench by attaching the base pieces to the benchtop by driving screws through the flanges and into the cleats on the underside of the boards (photo 3). You can mount the coat rack to the wall to keep your often-used accessories on hand — and off your furniture or the floor. It only requires a few parts and adds a lot of convenience. First, cut a 1x6 to length and then stain or seal it. Next, create the hooks by screwing together pipes and fittings (photo 1). Secure the pipe assemblies by driving screws through the flanges (photo 2). Then drive screws through the board and into the wall to mount the rack.